Ok guys lets make this our official thread. Who all will be racing this weekend? Is anyone signed up for the Friday track day? Do you have a link to the site to register for Friday? Shouldn't this thread be on NASA Northeast section of SM.com? The usual Mid Atlantic NASA guys should be there, us Cates boys, Copeland, Ellis, Thill, The RP guys including Kenny Zalner, Meathead and his gang, King Rat, should be a lot in SM. Of course the real reason we are going is the Daisy Duke Girls and .....???? Come on by the RP tent and we will have a beer waiting for you. Sorry no Danny's Angels but there probably will be some Wild and Wonderful West Virginia girls! No, they are not all sisters! I'm going for double duty and running the purple Cobra in ST-2. Windsor Customs will be supporting Shea Holbrook. Shea has signed on for the Mazda/NASA Challenge. SportsCar just had an article in First Gear last month about her. Looks, talent, smarts she has it all. This is going to be a fun filled weekend. OK you slackers. I left my wireless router unsecured all weekend hoping someone would post some updates! Great weekend of racing with everyone. Thanks so much for making me feel welcome on my first visit to Summit Point. It was a pleasure seeing all the old faces as well as meeting new ones. I watched many hours of video but was not quite prepared for how fast many of the corners are (especially the chute). This weekend I was introduced to the concept of gravel an inch away from the exit of turns. It scared the crap out of me at first but once I learned Sat night that my car would not get stuck or flip over if I touched the gravel I was able to alter my line to gain a little bit more speed. I still have plenty more speed to gain to hang with all you home trackers though. RP Performance: Thanks so much for going out your way to lend me a brake caliper with a panic trip to your shop when I discovered a brake caliper failure minutes before qualifying. You didn't even know who I was but dropped everything to help me. You guys rock! King Rat: Thanks so much for inviting me to pit with you. I had a great time and appreciate the fine hospitality. What a looooonnnnggggg weekend but there was some good racing when we were not around the hondas. I would first like to thank Brian Zalner for all the hard work that he put in to the #73 and I can now say the car is ready. Without the help of Brian, Bret of RP Performance and Performance Auto Works none of this would have been possible. I thank all you guys from the bottom of my heart for giving me a car that could have and should have won. All I can say is it coming and it is coming soon. I had the pole for Sat and Meathead was second. We ended up switching it around for the finish. Congrats Meat on the win....you put together a solid race. Meat, Me, B. Cates and Copeland was the top 4. Sunday Dean had the pole I was 2nd, Beaver (kid is a fast study with a good head on his shoulders), Meat 4th. After a few adjustments to the #73 by Brian the car was a monster and was flying. The brake pedal went to the floor while leading and I spun in 1. After dropping back to 16th or so it was an interesting charge through traffic. We ended up 5th with Dean taking the win, Beaver and Meat behind him. 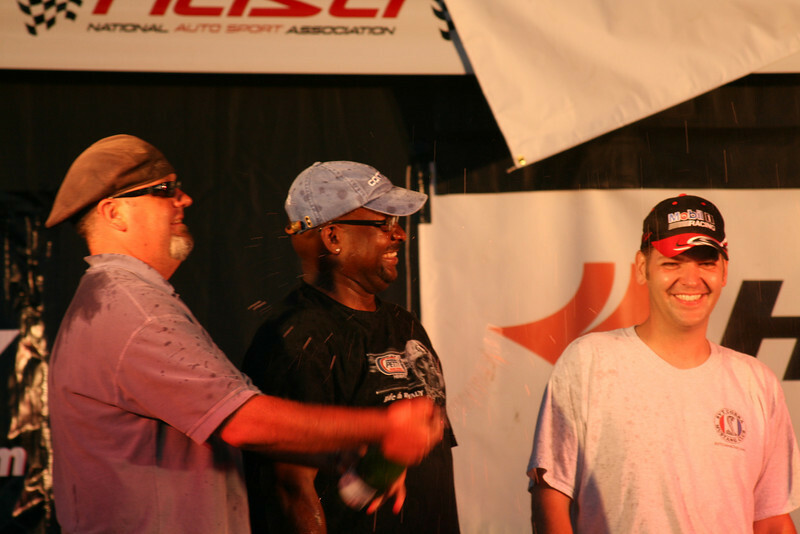 I can't wait for next weekend and the return of Z Spec Thanks to all for a fun weekend and once again congrats to Meat and Dean on their wins. 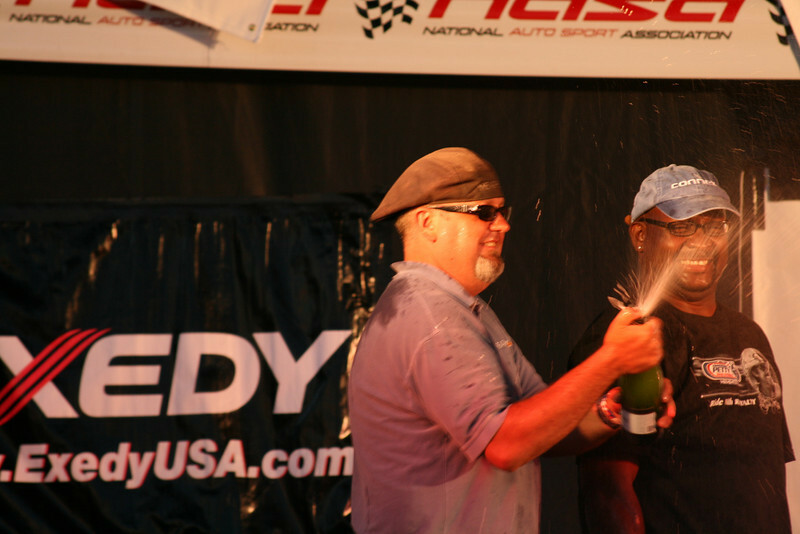 meathead needs to learn how to spray champagne! you're supposed to spray her! Sunglasses at night? Aren't you cool! Congrats on the win Mike! Wasn't night time. 8:00 pm. Sun still out. Anyone have official results from Sunday yet? Meat looks like some kind of famous artist! Good job on the win Meat. Was this one of the altered lines you mention? Who was driving the pace car during the Sun. qualifying race? I think he or she was trying for the track record. The field was paced too fast. We came around turn 10 at speed while cars were still coming out of the pits. I almost rear ended someone at 85 MPH...I had to drive off track and proceeded to do three (3) 360 degree spins......very scary. NASA needs to look into this and make sure it does not happen again. Sam, just ask Devin what can happen when you hit the gravel trap the wrong way! Devin set the fastest race lap then went off at turn 10 at the exit, still parallel with the track, never lifted, hit the big dip at the end of the gravel trap and well you can imagine the rest. Let's say we need new graphics for the right rear quarter. I was leading at the time and saw it all in my mirrors. I got hossed in traffic and Meat got by me with ease and then Kenny and I battled hard for second and I came up short by half a fender. Great race, unfortunately the camera stopped after the first lap. Thanks for all the great support from RP Performance, Bret, Brian, Kyle, you guys are the best! I have to double check, but unofficially, I believe the Olsinvest Financial Hardcharger was Tony Senese who made up 6 positions in Saturday's race. Greg Downer also made up 6 spots, but Tony had a higher finishing position. CongRATs to the top five finishers on Saturday who shared in the prize fund for the Sat. race which was put up by RP Performance and Carbotech Brakes. I thought the prize money was for Sunday's race. How about let's say there are still some construction issues to be addressed at SPR. We talked about this quite a bit last year, but nothing really came of it. It's getting where we can't even count how many cars that launch ramp at the end of T10 gravel trap has launched. And the numerous places where rock outcroppings take out rocker panels, subframes, etc. These aren't huge undertakings and we have racers who own construction companies that would be willing to work on this at a manageable cost..
Am I way out on a limb here? I agree with you. The gravel is just too deep there. You kind of get a false sense that you can drive over it. Should probably remove the gravel, fill in the hole with cement treated agregate, CTA, before putting some gravel over if needed. I guess we could talk to Bad Al and see who we need to talk to at the track. Does anyone know the official results for Sunday's race? Those photos actually show the 3rd of 3 full spins. I was about dizzy after that! I'll post the video soon of that and also of my off roading on the Sunday start. C'mon, Sam. I'm not ALWAYS in front of you! Sometimes you get out before I do in qualifying. It was supposed to be that way knucklehead! Results are posted on mylaps now. Thanks Alan, honestly I am not sure where that came from, my race Sunday was more typical, but I am going to give Dave at King Rat ALL the credit since he went over the car Thursday and got everything setup correctly for the first time in my racing life!!! Thanks Dave your the man! And thanks to you Alan, send me some more stickers so I can keep them on there when Sam rubs them off the next time!!!! Sam, you get 10 points for "style" on the Sat spin, but you have to deduct 10 for the dumbass move on Sunday. ...but you have to deduct 10 for the dumbass move on Sunday. You narrowed it down to one? The first step in ending a bad habit is admission.